This article is about the historic DNA X-ray diffraction image. For the play by Anna Ziegler, see Photograph 51 (play). 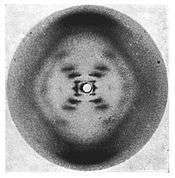 Photograph 51 is the nickname given to an X-ray diffraction image of DNA taken by Raymond Gosling in May 1952, working as a PhD student under the supervision of Rosalind Franklin, at King's College London in Sir John Randall's group. It was critical evidence in identifying the structure of DNA. James Watson was shown the photo by Maurice Wilkins without Rosalind Franklin's approval or knowledge (although by this time Gosling had returned to the supervision of Wilkins). Along with Francis Crick, Watson used characteristics and features of Photo 51 to develop the chemical model of the DNA molecule. In 1962, the Nobel Prize in Physiology or Medicine was awarded to Watson, Crick and Wilkins. The prize was not awarded to Franklin; she had died four years earlier, and the Nobel Prize's rules require that it be awarded only to living persons. The photograph provided key information that was essential for developing a model of DNA. The diffraction pattern determined the helical nature of the double helix strands (antiparallel). The outside of the DNA chain has a backbone of alternating deoxyribose and phosphate molecules, and codes for inheritance are inside the helix. Watson and Crick's calculations from Franklin's photography gave crucial parameters for the size and structure of the helix. Photo 51 became a crucial data source that led to the development of the DNA model and confirmed the prior postulated double helical structure of DNA, which were presented in the articles in the Nature journal by Raymond Gosling. As historians of science have re-examined the period during which this image was obtained, considerable controversy has arisen over both the significance of the contribution of this image to the work of Watson and Crick, as well as the methods by which they obtained the image. Franklin was hired independently of Maurice Wilkins, who, nonetheless, showed Photo 51 to Watson and Crick, without her knowledge. Whether Franklin would have deduced the structure of DNA on her own, from her own data, had Watson and Crick not obtained Gosling's image, is a hotly debated topic, made more controversial by the negative caricature of Franklin presented in the early chapters of Watson's history of the research on DNA structure, The Double Helix. Watson admitted his distortion of Franklin in his book, noting in the epilogue: "Since my initial impressions about [Franklin], both scientific and personal (as recorded in the early pages of this book) were often wrong, I want to say something here about her achievements." A 56-minute documentary DNA - Secret of Photo 51, was broadcast in 2003 on PBS NOVA. Narrated by Barbara Flynn, the program features interviews with Wilkins, Gosling, Aaron Klug, Brenda Maddox, including Franklin's friends Vittorio Luzzati, Caspar, Anne Piper, and Sue Richley. The UK version produced by BBC is titled Rosalind Franklin: DNA's Dark Lady. A play entitled Photograph 51 by Anna Ziegler focuses on the role of x-ray crystallographer Rosalind Franklin in the discovery of the structure of DNA. This play won the 3rd STAGE International Script Competition in 2008. It 2015, the play was put on at London West End, with Nicole Kidman playing Franklin. ↑ "DNA: the King's story". ↑ "Secret of Photo 51. Nova". PBS. ↑ The gene: a historical perspective. Greenwood Publishing Group. 2007. p. 85. ↑ Krock, Lexi (22 April 2003). "Anatomy of Photo 51". NOVA online. PBS. 1 2 3 Watson, James D.; Crick, Francis (1953). "A Structure for Deoxyribose Nucleic Acid" (PDF). Nature. 171 (4356): 737–738. doi:10.1038/171737a0. PMID 13054692. ↑ "My aunt, the DNA pioneer". BBC News. 24 April 2003. 1 2 Maddox, Brenda (2002). Rosalind Franklin: The Dark Lady of DNA. HarperCollins. ISBN 0-06-018407-8. ↑ "The instant I saw the picture my mouth fell open and my pulse began to race." -- James D. Watson (1968), The Double Helix, page 167. New York: Atheneum, Library of Congress card number 68-16217. Page 168 shows the X-shaped pattern of the B-form of DNA which provided details of the helical structure of DNA to both scientists Watson and Crick. 1 2 Maddox, Brenda (2002). Rosalind Franklin: The Dark Lady of DNA. HarperCollins. ISBN 0-393-32044-8. ↑ Max Perutz and the Secret of Life. Published in the UK by Chatto & Windus (ISBN 0-7011-7695-4), and in the USA by the Cold Spring Harbor Laboratory Press. ↑ Wilkins; Wilkins, M. (2003). The Third Man of the Double Helix, an autobiography. Oxford: Oxford University Press. ↑ Watson, James D. (1980). The Double Helix: A Personal Account of the Discovery of the Structure of DNA (1968). Atheneum. ISBN 0-689-70602-2. ↑ Sayre, Anne (1975). Rosalind Franklin and DNA. New York: W.W. Norton and Company. ISBN 0-393-32044-8. ↑ Watson, James D. Gunther Stent, ed. The Double Helix: A Personal Account of the Discovery of the Structure of DNA (1980 Norton Critical ed.). W.W. Norton and Company. ISBN 0-393-95075-1. ↑ Cox, Gordon (April 23, 2015). "Nicole Kidman to Star on West End in 'Photograph 51'". Variety. Retrieved 25 August 2015. ↑ "Ziegler's Photograph 51 Wins STAGE International Script Competition". American Theater Web News. August 5, 2008. Retrieved 25 August 2015.